French Polynesian airline Air Tahiti Nui is to replace its ageing Airbus A340-300 fleet with Boeing 787-9 Dreamliners. 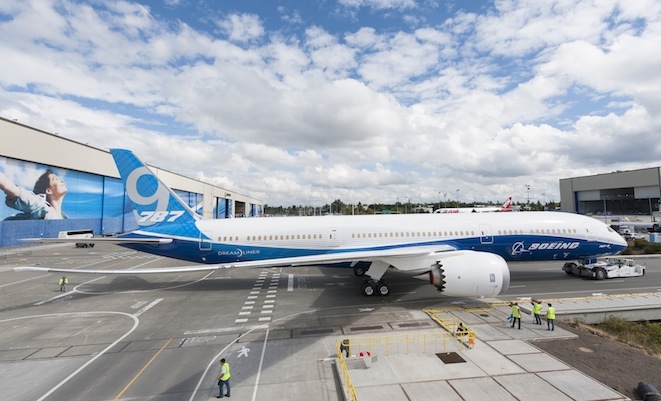 Four 787-9 aircraft will arrive to succeed the airline’s five-strong A340-300 fleet, which were manufactured between 2001 and 2005 and operate from the airline’s Papeete hub to Tokyo Narita, Auckland, and Los Angeles with onward services from LAX to Paris Charles de Gaulle. After over two decades of increasing ETOPS liberalisation, the raison-d’être of relatively small four-engined widebody aircraft has disappeared, and airlines worldwide are retiring their A340 fleets, which have become increasingly uneconomic to operate. Air Tahiti Nui’s A340-300 fleet is outfitted in a 2013-era two-class configuration with 32 angled lie-flat seats in a 2-2-2 configuration in its Poerava business class, plus 264 economy seats pitched at 32” in the standard 2-4-2 A340 layout. 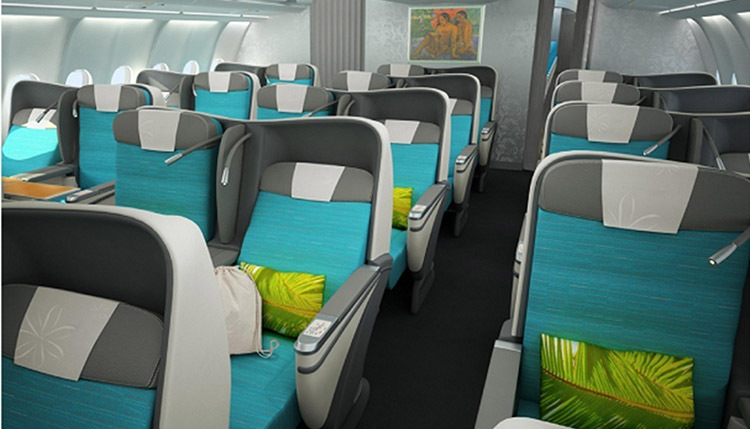 Business class on an Air Tahiti Nui A340-300. The airline hasn’t released details of its 787-9 interiors, stating only that “Air Tahiti Nui and Boeing plan to formalise the order during the coming months”, but a likely configuration given Air Tahiti Nui’s market positioning is similar to Chilean airline LAN’s 787-9. LAN — which incidentally is also replacing the A340-300s it uses on Australasian flights with the 787-9 — fits 30 fully flat beds in a 2-2-2 configuration and 283 economy seats in the high-density Dreamliner 3-3-3 layout that all 787 operators apart from Japan Airlines have chosen. In business class, Air Tahiti Nui could follow the trend of airlines that previously operated angled lie-flat seats choosing space-efficient fully flat beds like the B/E Diamond (seen on, among others, United’s 787-9 services) or, in a relatively uncompetitive market focussed almost entirely on leisure passengers, it could follow fellow Pacific stalwart Hawaiian Airlines and select a higher density premium product rather than one at the vanguard of business class seats. Yet with Air France’s Boeing 777-200ER (competing from Papeete to LA and Paris) replacing its angled lie-flat seats with Zodiac Cirrus reverse herringbone fully flat beds with direct aisle access, and Air New Zealand’s Boeing 767-300ER with relatively cramped recliners due to be succeeded by the Kiwi carrier’s newer Business Premier equipped widebodies on Auckland services, Air Tahiti Nui would be at a passenger experience disadvantage without a top-flight seat. Now that would be trouble in paradise. Makes perfect sense. I wonder if the 4 replacing 5 part is due to issues with the A340’s availability or just better use of the 789s. Plus, great to see some colour in the cabin! I understand why, but i’m sorry to see the Airbus A340 go.